About the Book"When I first discovered the grainy picture in my mother's desk-me as a towheaded two year old sitting in what I remember was a salmon-orange-stained lifeboat-I was overwhelmed by the feeling that the boy in the boat was not waving and laughing at the person snapping the photo as much as he was frantically trying to get the attention of the man I am today. The boy was beckoning me to join him on a voyage through the harrowing straits of memory. He was gambling that if we survived the passage, we might discover an ocean where the past would become the wind at our back rather than a driving gale to the nose of our boat. This book is the record of that voyage." My Take on the BookI had never read any of this authors' work in the past so I did not know what to expect, but the title alone sold me on this one. As I got into the book itself I was amazed to find that the book was amazingly honest and down-to-earth and the author has a style that will draw you in and make you think that you are sitting with him having a conversation. 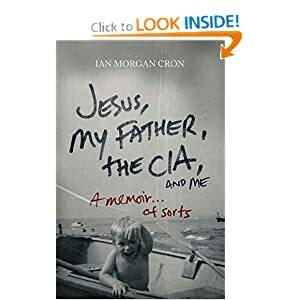 The authors' life growing up was amazingly tough, with an alcoholic father and not even knowing that his father was in the CIA, talk about dealing with a lot as a young child. As he continues to relate his story, he does a great job at taking the reader step-by-step through his life developing a clear picture of what life was live. His writing provides vivid images within my mind of the experiences that he had growing up, and I believe that this will only continue with other readers also! This was a powerful book that will make you reflect on your own childhood! A Must Read!